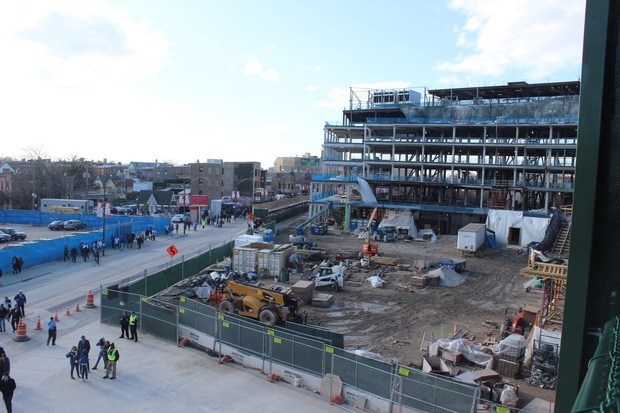 The half-finished Wrigley Field plaza on Opening Day 2016. WRIGLEY FIELD — Declaring the Wrigley Field plaza and ongoing renovations part of his family's legacy, Chicago Cubs Chairman Tom Ricketts said the team had compromised enough over the $750 million rehaul and deserves to operate the plaza as it sees fit. "The fact is, it's our property," Ricketts said. "The right answer is to let us continue to do what we've already discussed." 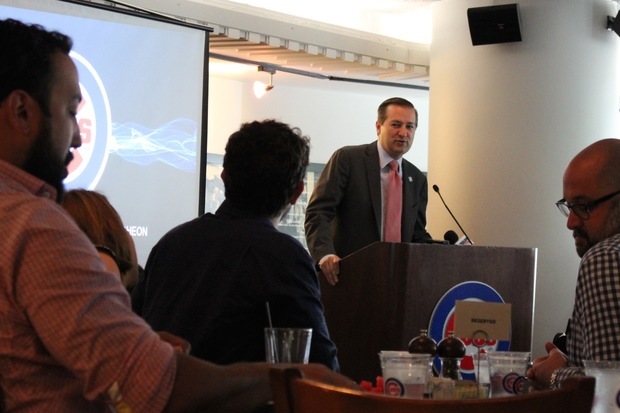 Ricketts spoke to the Lakeview Chamber of Commerce during an annual luncheon Wednesday, providing updates on renovations, the team's fight for a World Series championship and his vision for the controversial Clark Street triangle plaza outside Wrigley. Ricketts' comments come two weeks after Ald. Tom Tunney (44th) introduced a third version of an ordinance designed to control the use of the plaza. The latest iteration maintains the firm 9 p.m. cutoff on weekday alcohol sales and extends it to 10 p.m. on Fridays and Saturdays. It also allows alcohol on the plaza only during game days, concerts and up to eight special events per year. Only fans with tickets for concerts and games would be allowed on the plaza during those events. On Wednesday, Ricketts called for a return to the first ordinance draft proposed in late 2013, when the Cubs sought to have 25 events per year with amplified sound and closing times at 11 p.m. on weekdays and midnight Fridays and Saturdays. "We had a deal," Ricketts said. "Other than that, I don't think I should have to accept anything." The 2013 ordinance stalled in City Council and never passed. Tunney did not immediately respond to a request for comment on the 2013 ordinance or the status of the current one. The Cubs, through the Wrigley Field concessionaire, have applied for a patio liquor license that would allow alcohol sales during and after games and events. The team said it couldn't wait any longer for the ordinance to pass. 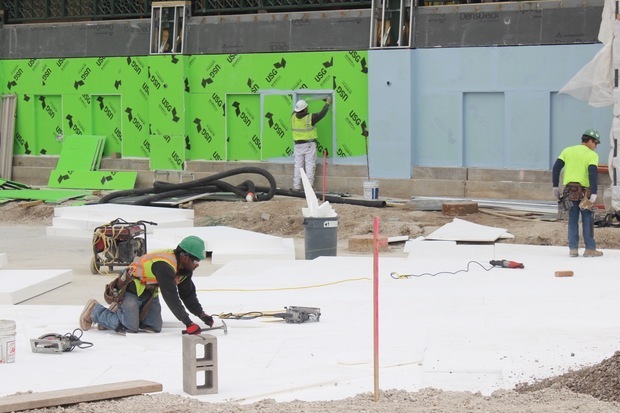 The plaza will be complete by the end of the 2016 season, with its adjacent office building ready to use in early 2017. But the patio liquor license would not allow for live or recorded music or special events like the the much-touted ice rink and family movie nights. Ricketts said he didn't know how the Cubs would be able to organize such community events with just the liquor license. As tensions rise over the plaza, Ricketts suggested the team had been treated unfairly in the most recent dealings. The Cubs secured private funding — largely from the Ricketts family — for the Wrigley Field renovations while also paying $21 million in public amusement taxes each year. The team has also donated $17.5 million since October 2009, including $4.8 million within Lakeview over the past five years, he said. It also pays for private security and garbage clean-up after games and events. "We're a 100 percent privately financed stadium asking for the ability to generate economic activity to offset some of the costs of saving a historic ballpark," said Ricketts. The total cost of the Wrigley Field renovations has climbed to $750 million after two years of construction, he added. Unlike Wrigley, Chicago stadiums like U.S. Cellular Field and Soldier Field were publicly funded and operated with help from the city's hotel tax. While Ricketts envisions creating a "world-class destination" akin to the palaces and landmarks of Europe, he said that requires generating revenue through alcohol sales and corporate events. "If we're going to create this beautiful public space that has all these community events, at some point we also have to support some of that with things that are also commercial activities," Ricketts said. "There's definitely a revenue component." During game days, he said, there would likely be "sponsor activation [and] brand building" with Cubs partners like Toyota. Ricketts offered up images of Toyota vehicles parked on the plaza, a bouncy slide and Clark the Cub mascot. Asked whether the Cubs could still host events like the family movie nights and ice rink without selling alcohol, Ricketts said there would be "a lot of days" without alcohol on the plaza. "But on game days, honestly, that's really the best way to serve our fans," he said. 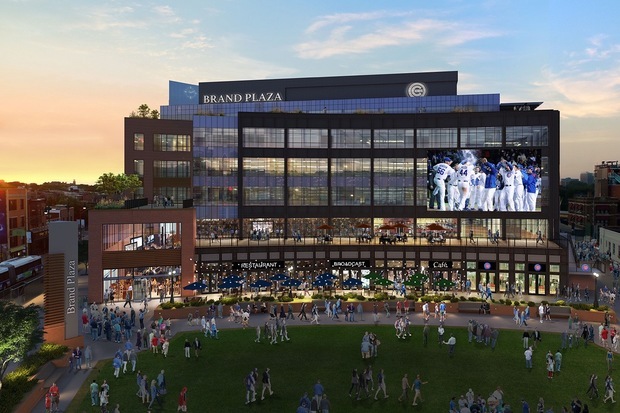 After compromising over the city's night game ordinance, placement of the video boards and outfield signage, Ricketts said it was time the team was allowed to use the plaza with the less restrictive ordinance proposed in 2013. "We still have severe restrictions relative to other teams," Ricketts said. "But it was our negotiated deal and we accept it." Two years after the original ordinance would have gone into effect, Ricketts said he's "very disappointed" to still be in talks, suggesting the time had come for the Cubs to get more support from the city. "It's pretty rare that you have a sports organization willing to pay their own expenses for their own ballpark and pay what are very high taxes relative to any other sports team," Ricketts said. The Ricketts family has sought to extend Cubs festivities outside the ballpark since it acquired the team in 2009. After nixing former owner Tribune Co.'s plans to build a parking garage and sports bar in the triangle plaza, the Cubs floated the idea of closing Sheffield Avenue during games, similar to Fenway Park selling concessions on closed streets during Boston Red Sox games. "We weren't allowed to do that," Ricketts said Wednesday. He noted that other teams like the St. Louis Cardinals and Pittsburgh Pirates have similar arrangements. Lakeview streets, he added, are already closed off frequently for street festivals and other events — though not as often as Sheffield would be for the dozens of Cubs games each season. Back in 2012, Tunney said Fenway Park was a "different neighborhood" with a "different evolution." At the time, the city was negotiating public financing for what was set to be a $300 million renovation of Wrigley Field. From here, the Cubs will await a decision on the patio liquor license as Tunney's ordinance makes it way through City Council. "We have a history of working things out with the city and the alderman," Ricketts said. "We'll be open minded, but we've already been through this once before."